Purpose: To report the intermediate-term safety and efficacy of Aurolab aqueous drainage implant (AADI) in patients with glaucoma. Methods: Retrospective review of patients who underwent AADI between January 2013 and December 2016. Patients aged >16 years and with a minimum follow-up of 6 months were included. Success was defined as complete when the intraocular pressure was ≥6 and ≤21 mmHg without antiglaucoma medication and as qualified if those requiring additional antiglaucoma medications were included. Results: The study included 55 patients (55 eyes) with a mean age ± standard deviation (SD) of 47.3 ± 18.1 years with a mean follow-up of 16.7 ± 11.4 months. Mean intraocular pressure reduced from 30.8 ± 11.1 mmHg to 13.1 ± 4.7, 14.1 ± 4.8, 15.7 ± 2.5 (P < 0.001) mmHg at 6 months, 1 year, and 2 years, respectively. The mean number of antiglaucoma medications reduced from 3.4 ± 1 to 0.8 ± 1.2, 0.7 ± 1.1, 0.8 ± 1 (P < 0.001) at 6 months, 1 year, and 2 years, respectively. The cumulative probability of complete and qualified success was 62% and 100% at 6 months, 54% and 92% at 1 year, and 43% and 88% at 2 years, respectively. Four patients failed during the follow-up period. Postoperative complication occurred in 28 eyes (51%), of which 17 eyes (31%) required intervention. Conclusion: AADI is a safe and effective treatment for the control of intraocular pressure in patients with glaucoma. Glaucoma is the leading cause of irreversible blindness in the world, and the prevalence of glaucoma in India ranges from 2.2 to 5.8%., Trabeculectomy still remains the primary surgical modality for the management of glaucoma in India. Glaucoma drainage device (GDD) plays a major role in patients with refractory glaucoma following failed trabeculectomy and in whom primary trabeculectomy is not possible due to scarred conjunctiva from previous surgery. The two most commonly used GDDs in the world are Ahmed glaucoma valve (AGV) and Baerveldt glaucoma implant (BGI). Randomized studies including Ahmed Baerveldt comparison (ABC) and Ahmed versus Baerveldt (AVB) reported both AGV and BGI to be equally efficacious. Cost of the implant is the major limiting factor in getting standard of care treatment in developing countries. In India, AGV costs around ₹16000 (US$ 250) whereas Baerveldt which costs around US$ 750 is not available. To overcome this financial barrier, Aurolab, Madurai has introduced Aurolab aqueous drainage implant (AADI) which is a nonvalved implant based on the prototype Baerveldt and costs only ₹3500 (US$ 50). Kaushik et al. reported the outcome of AADI in childhood glaucoma and Ray et al. reported the 1-year outcome of AADI in adult refractory glaucoma. The purpose of our study is to evaluate the intermediate-term safety and efficacy of AADI in the management of glaucoma among adults. We retrospectively reviewed the records of all patients who underwent AADI surgery between January 2013 and December 2016 at a tertiary eye care center in South India. Patients aged >16 years and with a minimum follow-up of 6 months were included in the study. Informed consent was obtained from all patients before the procedure. The study was approved by the Institute's ethics committee and performed in accordance with the tenets of the Declaration of Helsinki. 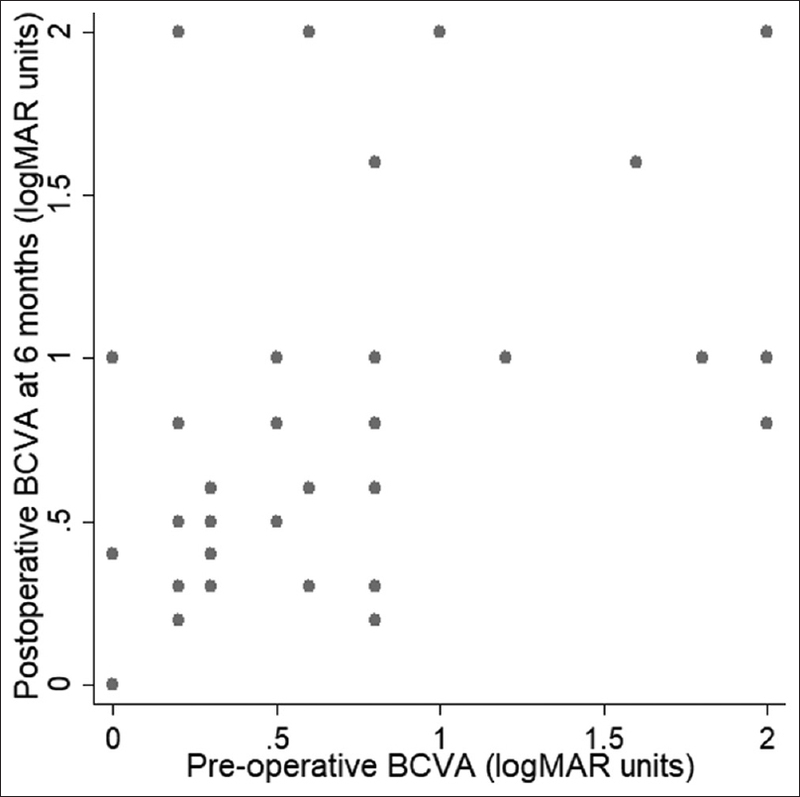 The data collected were age, gender, diagnosis, previous ocular surgery, best-corrected visual acuity (BCVA), intraocular pressure (IOP), optic disc findings, visual field changes, and number of antiglaucoma medications (AGM) in the preoperative period. Intraoperative details noted were quadrant of surgery, region of tube placement, and patch graft material used to cover the tube. Postoperative data collected were BCVA, IOP, AGM usage, complications, and interventions at all visits. Based on vertical cup-to-disc ratio (CDR), optic disc changes were classified as mild (<0.6), moderate (0.6–0.8), and severe (>0.8) damage. Humphrey visual fields were classified as early, moderate, and severe defects according to Hoddapp, Parrish, and Anderson classification. All patients underwent AADI (350 mm 2) surgery performed by one of the two glaucoma surgeons (GVR, CP). The quadrant of choice for the implant placement was left to the discretion of the surgeon. Corneal traction suture was applied with 8-0 polyglactin suture. A 3-clock hour conjunctival peritomy was performed and the adjacent rectus were identified and isolated. AADI tube patency was checked by irrigating with 28-gauge cannula and then ligated with 7-0 polyglactin suture close to the plate. Tube was rechecked again for absence of flow. Wings of the plate were placed under the muscle and secured to the sclera 8–10 mm posterior to the limbus with 9-0 nylon suture. Tube was cut to adequate length with bevel up and placed in the anterior chamber or vitreous cavity after making an entry with 23-guage needle. In case of tube placement in anterior chamber, entry was made 2 mm from the limbus, and in case of posterior segment tube placement, entry was made 4 mm from the limbus. Two venting slits were made with the needle of 9-0 nylon suture as per the discretion of the surgeon. Tube was secured to sclera with 10-0 nylon suture. The tube was covered with corneal or scleral patch graft. Patch graft was secured to sclera with 10-0 nylon suture. Conjunctiva was closed with 8-0 polyglactin suture. Postoperative management included the use of topical corticosteroid in tapering dosage for 8 weeks, antibiotics for 4 weeks, and AGM as required. Success was defined as complete when the IOP was ≥6 and ≤21 mmHg without AGM and as qualified if the IOP was ≥6 and ≤21 mmHg, with or without AGM. Failure was defined as IOP >21 mmHg on medical therapy, IOP <6 mmHg on two consecutive visits after 3 months, loss of light perception, additional glaucoma surgery for IOP control, and explantation of implant. Statistical analysis included mean and standard deviation (SD) for continuous variables. Wilcoxon-signed rank test was used to compare the pre and postoperative IOP and AGM. Kaplan–Meier survival curve was used to assess the survival probability. P value < 0.05 was considered to be statistically significant. Statistical analysis was performed using commercial software (Stata ver. 13.1; StataCorp, College Station, Tx). Fifty-five eyes met the inclusion criteria. The mean age ± SD of the study cohort was 47.3 ± 18.1 years (range; 17, 75); 42 (76%) patients were males and 13 (24%) were females. Mean follow-up period was 16.7 ± 11.4 months (median; 15, range; 6, 48). Glaucoma diagnosis in the study population were primary open angle glaucoma (7 eyes), primary angle closure glaucoma (7 eyes), glaucoma in pseudophakia (7 eyes), post-vitreoretinal surgery (7 eyes), traumatic glaucoma (7 eyes), iridocorneal endothelial syndrome (5 eyes), post keratoplasty (5 eyes), juvenile open angle glaucoma (4 eyes), pseudoexfoliation glaucoma (2 eyes), uveitic glaucoma (2 eyes), congenital glaucoma (1 eye), and steroid-induced glaucoma (1 eye). Six eyes had mild optic disc damage, 11 eyes had moderate damage, and 38 eyes had severe damage. Visual field analysis was available in 23 eyes, and the mean of mean deviation was 20.6 ± 8.1 dB. Five eyes had moderate loss, and 18 eyes had severe loss. Of the 55 eyes, 25 eyes underwent AADI as a primary glaucoma procedure, 23 eyes had 1 glaucoma procedure, and 7 eyes had 2 glaucoma procedures prior to AADI. Of the 25 eyes that underwent primary AADI, 18 eyes had previous ocular surgery (manual small incision cataract surgery in 13 eyes and vitreoretinal surgery in 5 eyes). Demographic data of the study cohort is summarized in [Table 1]. Forty-three eyes underwent surgery in the superotemporal quadrant, 8 eyes in the inferonasal quadrant, and 4 eyes in the inferotemporal quadrant. Of the 55 eyes, 52 eyes had tube placement in the anterior chamber and 3 eyes in the vitreous cavity. Three eyes that had tube placement in the vitreous cavity were vitrectomized eyes post vitreoretinal surgery. Scleral patch graft was used to cover the tube in 31 eyes and corneal patch graft in 24 eyes. Mean IOP reduced from 30.8 ± 11.1 mm Hg to 13.1 ± 4.7 mmHg at 6 months, 14.1 ± 4.8 mmHg at 1 year and 15.7 ± 2.5 mmHg at 2 years postoperatively (P < 0.001). 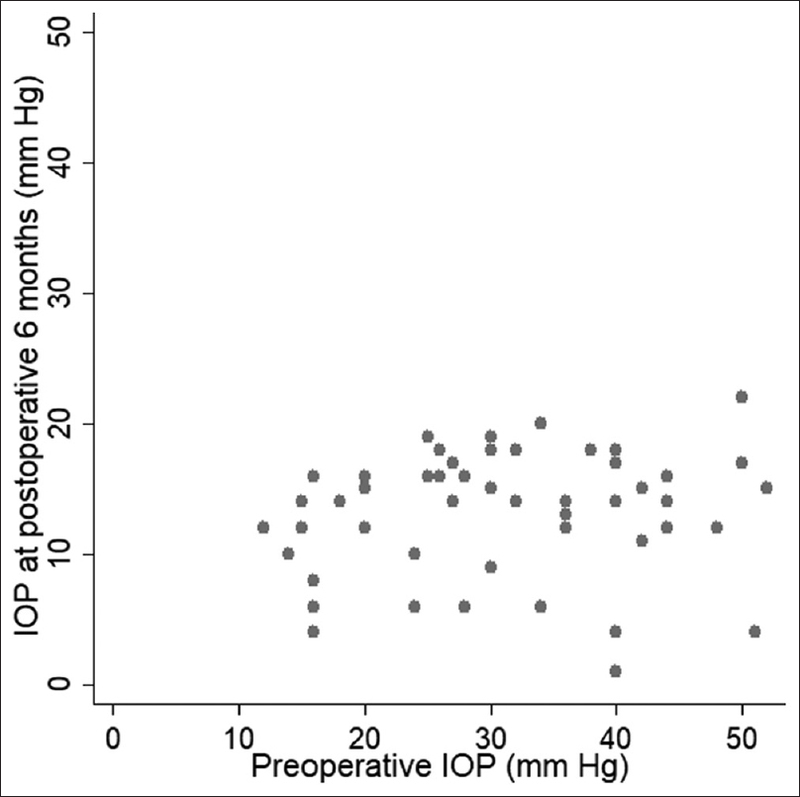 [Figure 1] shows the relationship between baseline IOP and postoperative IOP at 6 months. Mean number of AGM reduced from 3.4 ± 1, to 0.8 ± 1.2 at 6 months, 0.7 ± 1.1 at 1 year, and 0.8 ± 1 at 2 years postoperatively (P < 0.001) [Table 2]. Mean BCVA was 6/36 (range: 6/6, hand movements (HM)) preoperatively, and was 6/36 (6/6, perception of light) at 3 and 6 months, 6/48 (6/6, perception of light) at 1 year (P = 0.24, paired t test), and 6/60 (6/6, HM) at 2 years (P = 0.74, paired t test). Probability of complete success was 62% at 6 months, 54% at 1 year, and 43% at 2 years. Probability of qualified success was 100% at 6 months, 92% at 1 year, and 88% at 2 years. Kaplan–Meier survival curve for complete and qualified success is shown in [Figure 2] and [Figure 3], respectively. The cumulative probability of failure was 8% at 1 year and 12% at 2 years. Four eyes failed during the follow-up period. One eye had high IOP, 1 eye had explantation of implant, 1 eye had loss of light perception, and 1 eye developed endophthalmitis, which required evisceration. Postoperative complications occurred in 28 eyes (51%). The most common complication was hypotony in 10 eyes, of which 6 eyes had shallow chamber, persistent corneal edema in 5 eyes, tube retraction in 3 eyes, tube block by iris in 2 eyes and vitreous in 1 eye, tube corneal touch in 2 eyes, tube and plate exposure in 1 eye, bleb encapsulation in 1 eye, endophthalmitis in 1 eye, malignant glaucoma in 1 eye, vitreous hemorrhage in 1 eye, and diplopia in 1 eye. There were 20 postoperative interventions for complication in 17 eyes (31%). The most common intervention was anterior chamber reformation in 6 eyes followed by clearing of an occluded tube in 3 eyes, tube repositioning in 3 eyes, tube trimming in 2 eyes, implant removal in 1 eye, choroidal drainage in 1 eye, pars plana vitrectomy in 1 eye, tube ligation in 1 eye, anterior chamber paracentesis in 1 eye, and evisceration in 1 eye. [Table 3]. Glaucoma drainage devices have been used widely in the treatment of refractive glaucoma and even as a primary glaucoma procedure. Baerveldt implant was introduced in 1990 and it became the most preferred nonvalved implant due to its ease of implantation of large surface area implant in a single quadrant. Seigner et al. in a retrospective study of 103 eyes reported 350 and 500 mm 2 Baerveldt to be equally efficacious and better than 200 and 250 mm 2 implants in terms of achieving lower IOP. Britt et al. in an extended follow-up of a randomized controlled trial comparing the 350 and 500 mm 2 Baerveldt implant reported 350 mm 2 implant to be more successful than 500 mm 2 for overall IOP control. Aurolab uses the successful 350 mm 2 Baerveldt design to manufacture the AADI. The purpose of this study is to evaluate the outcome of AADI and to see whether it is comparable to Baerveldt in terms of safety and efficacy. In our study, the mean IOP decrease at 1 year was 16.7 mmHg (55%), which is more comparable to 49.9% in the tube group of TVT (tube versus trabeculectomy) study, and less compared to 57% in the Baerveldt group of AVB study  and 58% in the Baerveldt group of ABC study. Among the glaucoma subgroups, glaucoma in pseudophakia had the maximum IOP reduction (64%) and primary angle closure glaucoma had the least IOP reduction (41%). There is not much difference in the amount of IOP reduction between the eyes that underwent primary AADI (56%) and following glaucoma procedure (54%). The probability of complete success was 54% at 1 year in our study, which is better than 31% in ABC study, 17% in AVB study, and 34% in TVT study. If we consider the overall success at 1 year, our study (92%) had less success compared to TVT study (96%) and better success compared to ABC (86%) and AVB studies (73%). Tsai et al. in a retrospective series of 70 eyes reported an overall success of 73% at 1 year and 68% at 2 years. In their study, 50 eyes underwent 350 mm 2 and 20 eyes underwent 250 mm 2 Baerveldt implant. Krishna et al. in his series of 65 eyes reported a success rate of 71% at 2 years. Our study (88%) has better overall success rate at 2 years compared to Tsai et al. and Krishna et al. In eyes with primary AADI, the probability of complete success was 52% at 1 year and 35% at 2 years, and qualified success was 82% at 1 year and 74% at 2 years. In eyes that underwent AADI after glaucoma procedure, the probability of complete success was 55% at 1 year and 48% at 2 years, and qualified success was 100% at 1 and 2 years. There was no statistical difference between the two groups in complete success probability (P = 0.71, log-rank test), whereas eyes that underwent AADI after glaucoma procedure had better qualified success than eyes with primary AADI (P = 0.01, log-rank test). Visual acuity decrease of ≥2 Snellen lines was observed in 16 eyes (29%) in our study, which is comparable to 28% reported in the TVT study  and 34% reported in the ABC study. Of the 16 eyes that had a decrease of ≥2 Snellen lines, 11 eyes had postoperative complication. The most common cause for vision loss was glaucoma followed by corneal edema, cataract, macular edema, and endophthalmitis. Eight eyes had ≥2 Snellen lines improvement in visual acuity in the postoperative period compared to the baseline [Figure 4]. 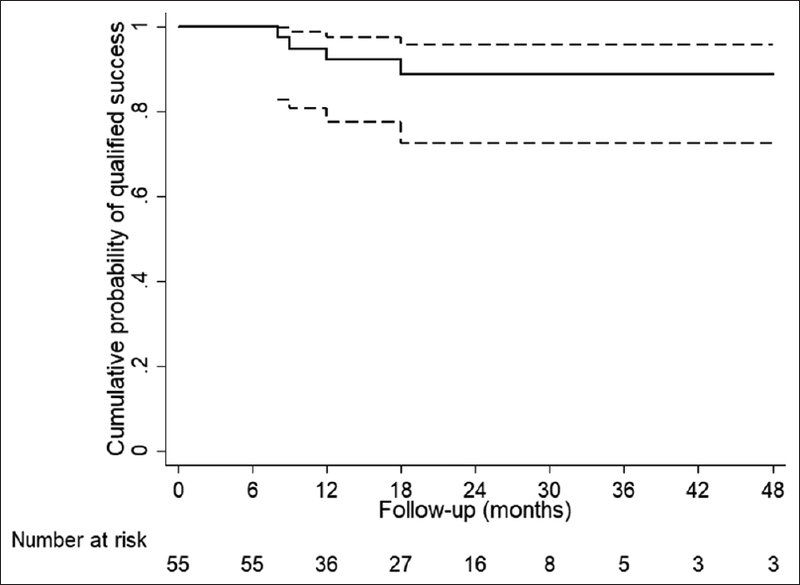 The cumulative probability of failure was 8% at 1 year and 12% at 2 years in our study. At 1 year, the cumulative probability of failure was 14% in ABC study, 28% in AVB study, and 4% in TVT study. Tsai et al. reported a failure rate of 27% at 1 year and 32% at 2 years. Krishna et al. reported a failure rate of 29% at 2 years. The reason for failure in our study was high IOP in 1 eye, which developed an encapsulated bleb and the IOP failed to come under control with medical management. One eye had hypotony associated with tube and plate exposure, which required explantation of the implant, and underwent trabeculectomy later for IOP control. One eye with secondary glaucoma lost light perception of vision in the postoperative period. One eye post therapeutic keratoplasty had recurrent corneal ulcer in the graft after AADI, which ended up in endophthalmitis and underwent evisceration. Postoperative complications were reported in 28 eyes (51%) in our study, which is more compared to 34% in the TVT study  and less compared to 54% and 58% in the AVB  and ABC studies, respectively. Hypotony (10 eyes) was the most common complication in our study which occurred between 4 and 6 weeks post surgery when the tube opens. Of the 10 eyes with hypotony, 6 eyes had associated shallow anterior chamber and underwent anterior chamber reformation, and the remaining 4 eyes were managed conservatively. Comparison of postoperative complications of our study with others is shown in [Table 4]. Of the 28 eyes in our study that had a complication, 17 eyes (31%) required intervention, which is less compared to 42% reported in the AVB study  at 1 year. 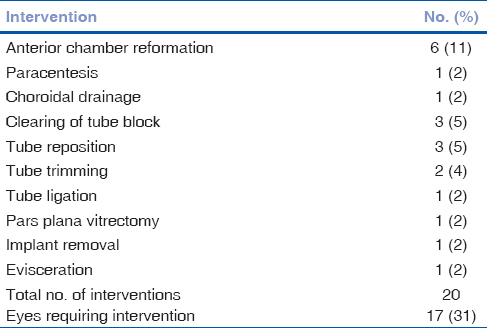 Anterior chamber reformation is the most common intervention performed in 6 eyes (11%) in our study, which is similar to 11% reported in the AVB study. Limitations of our study were its retrospective nature, heterogeneous cohort, small sample size, and short follow-up. Visual fields were not evaluated in the follow-up period to assess the disease progression. Despite these limitations, our study is the first to report the intermediate-term outcome of AADI in adult glaucoma. AADI being an indigenous product reduces the financial burden of the patient and makes it an affordable option in a developing country. Glaucoma being a chronic progressive disease prospective study is required to assess the long-term safety and efficacy of AADI. AADI is comparable to Baerveldt implant in terms of safety and efficacy in the management of adult glaucoma. We would like to thank Dr. Harsha L Rao for his help in statistical analysis. Ramakrishnan R, Nirmalan PK, Krishnadas R, Thulasiraj RD, Tielsch JM, Katz J, et al. Glaucoma in a rural population of southern India: The Aravind comprehensive eye survey. Ophthalmology 2003;110:1484-90. Garudadri C, Senthil S, Khanna RC, Sannapaneni K, Rao HB. Prevalence and risk factors for primary glaucomas in adult urban and rural populations in the Andra Pradesh Eye Disease Study. Ophthalmology 2010;117:1352-9. Budenz DL, Barton K, Gedde SJ, Feuer WJ, Schiffman J, Costa VP, et al. Five-year treatment outcomes in the Ahmed Baerveldt comparison study. Ophthalmology 2015;122:308-16. Christakis PG, Kalenak JW, Tsai JC, Zurakowski D, Kammer JA, Harasymowycz PJ, et al. The Ahmed versus baerveldt study: Five-year treatment outcomes. Ophthalmology 2016;123:2093-2102. Kaushik S, Kataria P, Raj S, Pandav SS, Ram J. Safety and efficacy of a low-cost glaucoma drainage device for refractory childhood glaucoma. Br J Ophthalmol 2017;0:1-5. Pathak Ray V, Rao DP. Surgical Outcomes of a New Low-Cost Nonvalved Glaucoma Drainage Device in Refractory Glaucoma: Results at 1 Year. J Glaucoma 2018;27:433-39. Hodapp E, Parrish RK II, Anderson DR. Clinical Decisions in Glaucoma. St. Louis: The Mosby Co; 1993. p. 52-61. Siegner SW, Netland PA, Urban RC Jr, Williams AS, Richards DW, Latina MA, et al. Clinical experience with the Baerveldt glaucoma drainage implant. Ophthalmology 1995;102:1298-307. Britt MT, LaBree LD, Lloyd MA, Minckler DS, Heuer DK, Baerveldt G, et al. Randomized clinical trial of the 350-mm 2 versus the 500-mm 2 Baerveldt implant: Longer term results: Is bigger better?. Ophthalmology 1999;106:2312-8. Gedde SJ, Schiffman JC, Feuer WJ, Herndon LW, Brandt JD, Budenz DL. 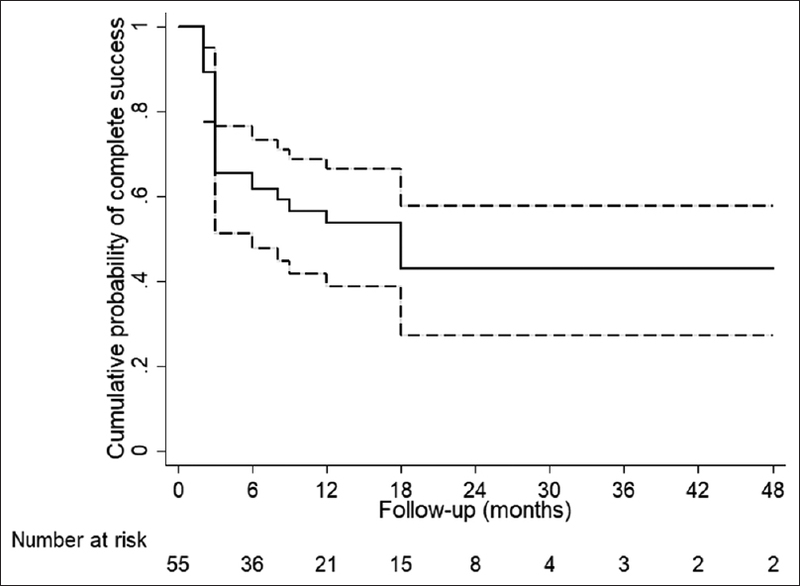 Treatment outcomes in the tube versus trabeculectomy study after one year of follow-up. Am J Ophthalmol 2007;143:9-22. Christakis PG, Kalenak JW, Zurakowski D, Tsai JC, Kammer JA, Harasymowycz PJ, et al. The Ahmed Versus Baerveldt study: One-year treatment outcomes. Ophthalmology 2011;118:2180-9. Budenz DL, Barton K, Feuer WJ, Schiffman J, Costa VP, Godfrey DG, et al. Treatment outcomes in the Ahmed Baerveldt comparison study after 1 year of follow-up. Ophthalmology 2011;118:443-52. Tsai JC, Johnson CC, Dietrich MS. The Ahmed shunt versus the Baerveldt shunt for refractory glaucoma: A single-surgeon comparison of outcome. Ophthalmology 2003;110:1814-21. Krishna R, Godfrey DG, Budenz DL, Escalona-Camaano E, Gedde SJ, Greenfield DS, et al. Intermediate-term outcomes of 350-mm 2 Baerveldt glaucoma implants. Ophthalmology 2001;108:621-6. Gedde SJ, Herndon LW, Brandt JD, Budenz DL, Feuer WJ, Schiffman JC. Surgical complications in the Tube Versus Trabeculectomy Study during the first year of follow-up. Am J Ophthalmol 2007;143:23-31.